Depending on where you live, one of the above mentioned words is commonly used to describe the disrespectful rebuttal kids give their parents from time to time. No matter how cute the kid―or the word you use―is, back-talk is not a desired attribute. My oldest child is very articulate. 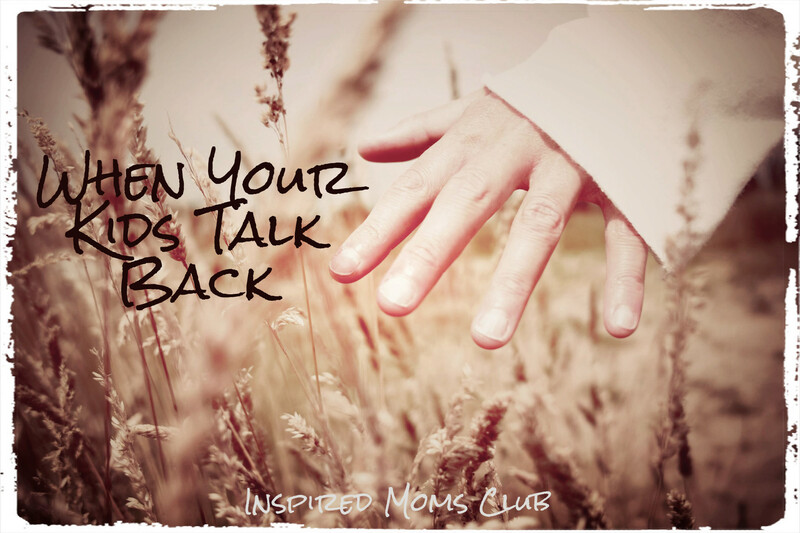 By 2 years of age, when most moms are excited to hear their little ones talking, I remember having to reprimand my son for talking back! I took the hard, fast rule of 0 tolerance and a little pop on the mouth when necessary. No child of mine was going to talk to me like that! I was raised under the strong-arm of a Mom who loved us dearly and disciplined from fear and strict rules. Although I appreciate some of her methods now and can say they were absolutely effective (in the sense that it produced compliance), I am also seeing a new path for me and my children. I have been on a journey to change my tactics. It is scary and I have no real template from my past saying this is the better path. I want to teach my kids to obey out of their love for God and our relationship. This is taking longer to see compliance, but I am modeling it after what I feel God is teaching me about love and discipline. To be honest, I still spank my children, but it is not my only go to and it does not fit all scenarios. I still fight the ingrained methods of my past. Now, in the moment, I struggle not to fall on what I know. I wish I was in a better place with all of it, but such is life: A process and a journey into the newness and grace of God. He knew I would struggle with indignation towards my children and yet he saw fit to give me three borderline sassy children. (They get it honest, let me tell you. I see so much of myself in these kids it is downright scary! There are days when I want to weep at my mother’s feet and apologize for every sassy word I spoke.) With all that said, here is how I envision being able to handle (sass) back-talk in my house. I find myself doing this more and more. My five-year old has a desire to wear the same dress day in and day out. She got a new one yesterday and wore it out and about. She wanted to wear the same one again today. Personally, I do not care as long as it is clean and appropriate attire for wherever she is going. This morning as I was telling her sister to get dressed, my five-year old looked at me smugly and said, “I’m wearing this dress again today.” Now the old me would have made her change just because she told me she was wearing it and with such attitude. Instead, I looked at her and explained that her attitude was unnecessary. Then I asked her to rephrase her sentence to a question. I said, you need to ask Mommy, “Is it okay if I wear this dress again?” I explained that I generally don’t care if she wears her clothes on repeat, but that her tone and attitude was not how I wanted talked to. I modeled all of this in a calm tone. She apologized and asked nicely and then I responded with a yes and a thank you for the polite question. My goal in doing this is to reinforce polite interaction. The dress was not a high stakes situation, but I am setting a precedent. I expect respect and I give respect. I bend when I can, but bending comes easier when there is respect and love. Now my seven-year old is further along in this journey and we have been going round and round for five years now. When he is in a place where his language―both body and verbal―are not respectful, I will typically send him to his room and allow him to think (on his own) about how he can better interact with us. He gets it and has had enough training that he understands what this means. This space also gives us all a moment to cool down. I am one who is quick to take up the right in fighting and can damage a relationship at the cost of justice. I am learning that space and quiet moments in a fight can do wonders! This space creates a new ground, a less tense place to begin again. I want to hear him and I want him to feel safe to express his feelings to us, but there is a respectful way and time to do that and he is learning. As I am writing this and reflecting on how far we (my son and I) have come with our arguments and his back talk. I can see the progress and I can also see we have his heart, not just his compliance. Isn’t that what we all want? We want our kids’ hearts, not just their compliance. Loyalty, trust, and obedience flow best from a connected heart. We can all perform out of wooden acts and we can comply on the outside, however, it is not going to last if there is no heart connection to the source of the request. We desire to have our kids love, trust, and obey us. They will do this much more freely in the future if we have their heart. These young years are hard and you feel like you are tending to so many different plants in the garden of their heart, but the hard work is now so the fruits will be good. Pruning in the future will be easier as well, because you see the results of hard work from the past. I am not saying the teen years will be easy, I am simply saying you do not want to deal with establishing respect as well as enforcing all the new stuff the teen years bring. You want to give attention to the things that are now so they are not uncharted territory later. When my children are teens, and they choose to talk-back, they will already know what the consequence is for such a choice. They won’t have to work on grasping the expectations of our home in that area.